This two bedroom plus loft, three bathroom condominium at Lake Forest offers some of the best unobstructed views of Lake Dillon and the surrounding mountains. With doors from either bedroom and living area, step out onto the private patio or green grass to enjoy your views of the Rocky Mountains and beautiful Lake Dillon. With a kitchen that overlooks and opens into the living and dining areas this condo was built with comfort in mind. 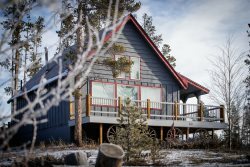 At the end of a day exploring Colorado's Playground enjoy one of the three hot tubs situated on the hill overlooking the Rocky Mountain Range. We rented our place thru Airbnb and Ashley was super with responsiveness even though she was the only one working this weekend. Our condo/townhome was also ready available earlier than check-in time which was nice. We had a great time and loved our place. It was clean and cozy and had more than enough to accommodate seven of us.